It has finally happened people. Here I am about to review a top-down racer where it can't end it with the line of "it was alright, but it wasn't anywhere close to being as good as Micro Machines." Not playing a Micro Machines game since back in my Mega Drive days, nostalgia has played a massive role in the feelings I have for the previous games. 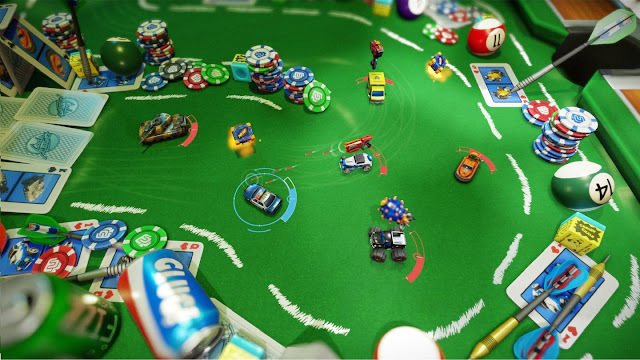 Looking back through my rose-tinted glasses, Micro Machines was always a game that offered a tonne of living room entertainment with actual people back before we had online play on our home consoles. These days, however, you don't need extra joypad ports in a game cartridge to play with a bunch of people, with modern day gaming putting you in contact with a bunch of faceless people at the press of a button. Off the bat, I'm going to tell you that Micro Machines World Series is very much an online experience this time around, with the setting to still play with those in your living room there, but the online side certainly is a massive portion of the game. While being an online game, however, it did feel odd seeing races and events only partially full with real players, with AI players always tending to outnumber the real people in my games. Why bother trying to find me an online game if all the players are all going to be AI racers, more so, why make me wait a minute and a half to get it going if that's the case. The game loads up with a menu that offers you four playing options in total, those four options being Special Event, Quick Play, Ranked Match, and wrapping things up the AI and local option for the game, Skirmish. Special event is a mode that unlocks every few days and offers a certain mode with certain tweaks to it. I played one where you had more energy and stronger weapons, so currently nothing mind blowing to speak of. I've not played anything that made me think "wow, this offers something completely different" at all. There is an achievement for playing in one of these, and that's all that makes you load it up to begin with. Hopefully a few more interesting modes in the future. Quick Play is where you will come before you are able to play Ranked, as to unlock that mode you need to be a level 10. Here you can choose Battle (Capture the Flag, King of the Hill), Race, and Elimination (more on this mode below). Ranked, like I said earlier, unlocks when you reach XP level 10 within the game, only ranking up when playing either Quick Play or Special modes, as local play will not count. This can be a bit of a pain in truth, as to get there it will take and hour or two of playing these events. In ranked you're racing to get earn points, earn enough by the time the season ends to claim as many of the prizes available. You can see an image below which is showing off the current season and its offerings. The two main events (Quick Play & Ranked Match) offer the same race modes to you, with those events being either Battle (Capture the Flag & King of the Hill), Race, and Elimination. While Battle and Race pretty much explain themselves, I do need to talk a little about what Elimination offers you. In Elimination the big change is the camera angle, with the camera this time around feeling a little more lower down and zoomed in, making for a much tougher race as it goes on. The goal is to keep getting to the front of the pack while getting your opponents out of the view of the screen to claim first place. You must do this enough times to claim pole position on the score track found at the top of the screen. Skirmish is the last mode. and this is simply where you come to race offline with up to 3 other players in the modes already mentioned. The one different mode this mode offers is free for all, a mode where you load into an arena like setting with the goal of simply blowing up other players until one stands tall. Weapons need to be spoken about too, and I'm not talking about each car having their own unique weapon set when it comes to playing battle either, but more the ones used in races and elimination. You have three in total, a hammer, a pellet gun, and finally a bomb that drops behind you. These are fun to begin with, but you soon find yourself getting angry at them the more they screw you over, more so in race events with the AI. Basic race events don't need them really, with the tight courses and objects on the track already offering enough of a challenge to end the race in top spot as it is. Weapons can take this mode from being a fun experience to you losing your mind when an opponent wipes you out on the last corner with a hammer nowhere near you thanks to glitchy lag in seconds. I Would have loved a race mode where these can be removed, so hopefully, that gets added in an update in the future. Ranking up levels and doing well in Ranked does gain you some Loot Boxes to open. With these, you can find things to tweak any of the twelve cars available to you. This can be a paint job, voice lines, gloats (the image a player sees when you kill them), and also grave stamps (a mark on the track where you made some blow-up. 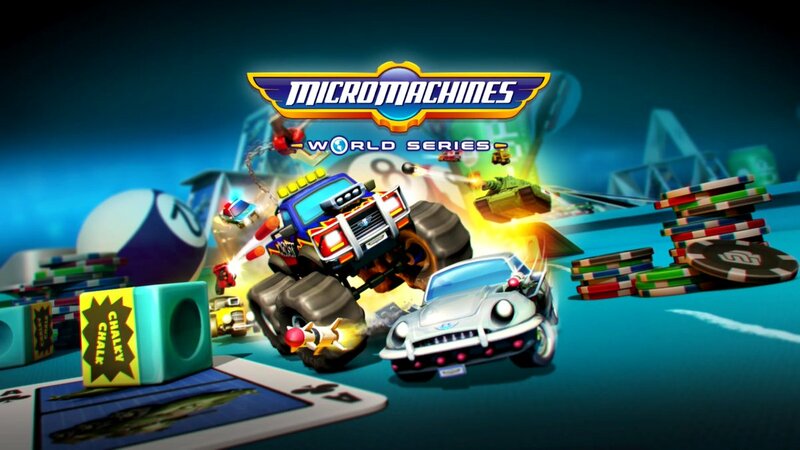 Overall: While Micro Machines World Series ticks all the right boxes when it comes to feeling like the series we all loved, it lacks in areas which stop it being as addictive as the classics. It needs more content to make it something that will keep your attention for longer than a week or two. As it stands now, it's a game you will load up to play, only to turn it off to play something else thirty minutes or so later once the honeymoon period is out the way. Always had a soft spot for this franchise.